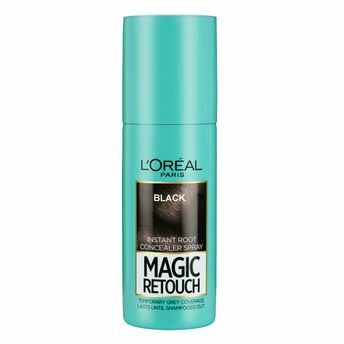 The L'Oreal Paris Magic Retouch is an instant root concealer spray that covers grey roots in just one quick spray - when, Where and how you need it. Perfectly matches and blends with your hair color. 3 seconds to a flawless root touch up. The pinpoint micro-diffuser precisely targets greys and the rich color pigments give you perfectly blended coverage.Lasts until washed out. No transfer, Lightweight formula. Available in brown and black hair color. Find your shade! Additional Information: A global beauty care brand, L’Oréal Paris believes in the essence of helping every woman embrace her unique beauty while reinforcing her innate sense of self-worth with their internationally renowned, Diversive products. The brand has a wide range of affordable luxury, High-quality products in categories like skin care, Hair care, Hair color and makeup. Grey hair? Need a quick touch up? No time to colour those grey roots? Introducing the new L'Oreal Paris Magic Retouch, the first instant root touch up spray that covers grey roots, giving you a flawless and natural look in just 3 seconds. It is effortless, smudgeless and damageless with a quick dry formula. The spray is a temporary hair colour and lasts till the next wash.
HOW TO COVER GREYS IN 3 SECONDS? Keep at a distance of 10-15 cm and spray on the grey roots. Wait for 2-3 minutes for the colour to dry. Comb for an even finish. Protect your face with hands while applying on the temples and hairline. If the product stains on your skin, use a wet tissue to remove it. This is a temporary hair colour and lasts till the next wash. Product lasts up to 25 applications. Completely smudgeless once dry and colour does not come off or stain your clothes. Magic Retouch is a temporary hair colour and is not recommended in heavy rains as colour might come off due to the action of water. Explore the entire range of Hair Color available on Nykaa. Shop more L'Oreal Paris products here.You can browse through the complete world of L'Oreal Paris Hair Color .Alternatively, you can also find many more products from the L'Oreal Paris Magic Retouch Instant Root Concealer range.